If the ghosts are real, who are you gonna call? Don't worry, the Ghostbusters aren't needed for this case because it's already been solved. Earlier today, Activision officially announced that Call of Duty: Ghosts will be haunting current gen as well as next gen consoles in November. November 5th to be exact; so what do we know about Ghosts? We know the game is being developed by original Call of Duty studio Infinity Ward. From what Activision released in a statement earlier, Ghosts "delivers a riveting all-new gameplay experience built on an entirely new story, setting and cast of characters, all powered by a new, next generation Call of Duty engine that redefines the series for the next generation." The box art and logo have been shown over the course of the week. Along with confirming Ghosts, Activision released a live-action trailer which should give us some insight to what the game will offer. “Everyone was expecting us to make Modern Warfare 4, which would have been the safe thing to do," said Infinity Ward executive producer Mark Rubin, "but we're not resting on our laurels. We saw the console transition as the perfect opportunity to start a new chapter for Call of Duty. So we're building a new sub-brand, a new engine, and a lot of new ideas and experiences for our players. We can't wait to share them with our community." “Infinity Ward set the gold standard for first-person action for a generation, and they’re going to do it again with Call of Duty: Ghosts,” said Activision Publishing CEO Eric Hirshberg. 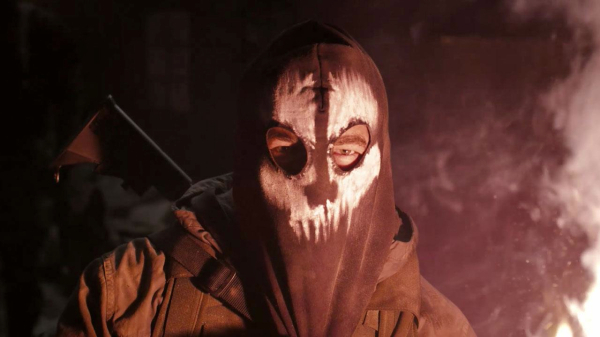 “Ghosts delivers an all-new story, all-new characters, an all-new Call of Duty world, all powered by a next generation Call of Duty engine, which is a leap forward for the franchise. Infinity Ward is going all-in to create the next generation of Call of Duty worthy of the world’s greatest fans." Nothing else is known about Ghosts but we won't have to wait much longer to find out more. During the Xbox Event on May 21st, additional details will be shared concerning Call of Duty: Ghosts. Plus, we are also going to get "an exclusive first look at the game." So yes ladies and gentlemen...the ghost are real. Are you excited for the new Call of Duty game or do you believe it should take a rest? It also looks like we will see more on Call Of Duty: Ghosts at the Xbox Reveal Event on May 21st! Bathroom Management Sim Coming To Vita?